Let's say you have two Excel workbooks, or maybe two versions of the same workbook, that you want to compare. Or maybe you want to find potential problems, like manually-entered (instead of calculated) totals, or broken formulas. If you have Microsoft Office Professional Plus 2013, you can use Microsoft Spreadsheet Compare to run a report on the differences and problems it finds. Important: Spreadsheet Compare is only available with Office Professional Plus 2013 or Office 365 ProPlus. In Windows 7 On the Windows Start menu, under Office 2013 Tools, click Spreadsheet Compare. In Windows 8 On the Start screen, click Spreadsheet Compare. If you do not see a Spreadsheet Compare tile, begin typing the words Spreadsheet Compare, and then select its tile. Click Home > Compare Files. The Compare Files dialog box appears. Click the blue folder icon next to the Compare box to browse to the location of the earlier version of your workbook. In addition to files saved on your computer or on a network, you can enter a web address to a site where your workbooks are saved. Click the green folder icon next to the To box to browse to the location of the workbook that you want to compare to the earlier version, and then click OK. Tip: You can compare two files with the same name if they're saved in different folders. In the left pane, choose the options you want to see in the results of the workbook comparison by checking or unchecking the options, such as Formulas, Macros, or Cell Format. Or, just Select All. Click OK to run the comparison. If you get an "Unable to open workbook" message, this might mean one of the workbooks is password protected. Click OK and then enter the workbook's password. Learn more about how passwords and Spreadsheet Compare work together. The results of the comparison appear in a two-pane grid. The workbook on the left corresponds to the "Compare" (typically older) file you chose and the workbook on the right corresponds to the "To" (typically newer) file. Details appear in a pane below the two grids. Changes are highlighted by color, depending on the kind of change. In the side-by-side grid, a worksheet for each file is compared to the worksheet in the other file. If there are multiple worksheets, they're available by clicking the forward and back buttons on the horizontal scroll bar. Note: Even if a worksheet is hidden, it's still compared and shown in the results. Differences are highlighted with a cell fill color or text font color, depending on the type of difference. 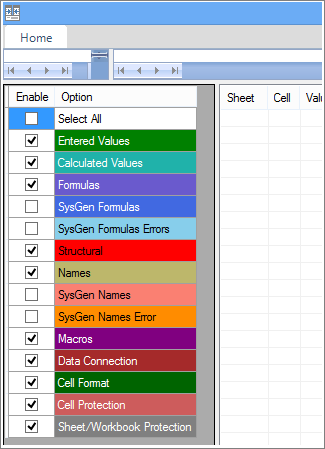 For example, cells with "entered values" (non-formula cells) are formatted with a green fill color in the side-by-side grid, and with a green font in the pane results list. The lower-left pane is a legend that shows what the colors mean. In the example shown here, results for Q4 in the earlier version weren't final. The latest version of the workbook contains the final numbers in the E column for Q4. In the comparison results, cells E2:E5 in both versions have a green fill that means an entered value has changed. 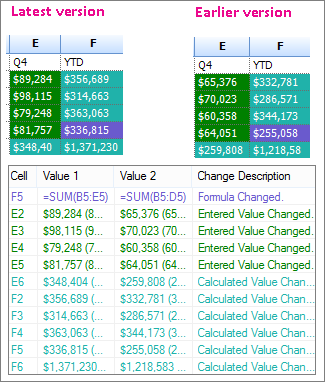 Because those values changed, the calculated results in the YTD column also changed – cells F2:F4 and E6:F6 have a blue-green fill that means the calculated value changed. The calculated result in cell F5 also changed, but the more important reason is that in the earlier version its formula was incorrect (it summed only B5:D5, omitting the value for Q4). When the workbook was updated, the formula in F5 was corrected so that it's now =SUM(B5:E5). If the cells are too narrow to show the cell contents, click Resize Cells to Fit. In addition to the comparison features of Spreadsheet Compare, Excel 2013 has an Inquire add-in you can turn on that makes an "Inquire" tab available. From the Inquire tab, you can analyze a workbook, see relationships between cells, worksheets, and other workbooks, and clean excess formatting from a worksheet. If you have two workbooks open in Excel that you want to compare, you can run Spreadsheet Compare by using the Compare Files command. If you don't see the Inquire tab in Excel 2013, see Turn on the Inquire add-in. To learn more about the tools in the Inquire add-in, see What you can do with Spreadsheet Inquire. If you have "mission critical" Excel workbooks or Access databases in your organization, consider installing Microsoft’s spreadsheet and database management tools. Microsoft Audit and Control Management Server provides powerful change management features for Excel and Access files, and is complemented by Microsoft Discovery and Risk Assessment Server, which provides inventory and analysis features, all aimed at helping you reduce the risk associated with using tools developed by end users in Excel and Access. Also see Overview of Spreadsheet Compare.